Displaying 351 items on 18 page(s). 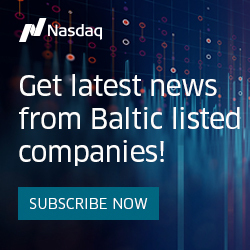 The announcements displayed in this section have been disclosed by Nasdaq Baltic Exchanges, issuers whose securities are listed and/or admitted to trading on Nasdaq Baltic Exchanges or on First North (Alternative Market) Baltic multilateral trading facilities (MTF), and by First North Certified Advisors. Nasdaq First North is a multilateral trading facility (MTF), also known as an Alternative Market, operated by the different exchanges within Nasdaq. It does not have the legal status of an EU regulated market. Companies on First North are subject to the rules of First North and not the legal requirements for listing or admission to trading on a regulated market.